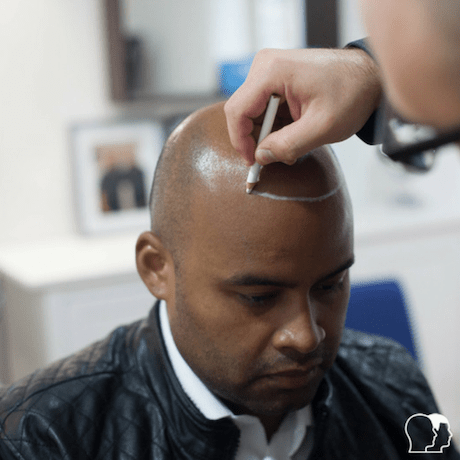 Once you’ve agreed to go ahead with our scalp micropigmentation service, it can seem pretty daunting at first. 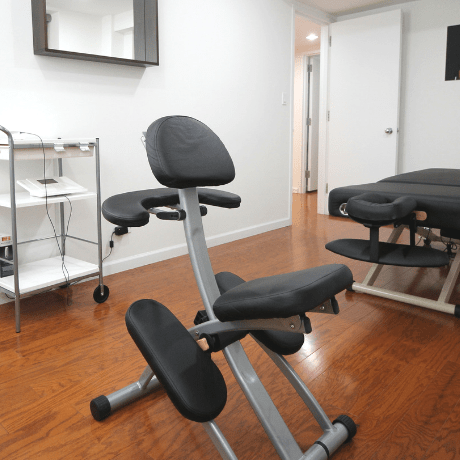 Although you would have visited our clinic for a free initial consultation, you will naturally have some nerves once you arrive for the first session. A lot of people ask what they should expect when they arrive for their first Scalp Micropigmentation session. We have an open forum which includes lots of real clients experiences and photos after each session, you can check that out here. If you know what’s to come at your first Scalp Micropigmentation session then you will feel more relaxed and confident. Read on to find out more of what happens on the day. When you arrive for your first SMP session the first step is to fill out some paper work and make a payment. After this, you will sit down and discuss your treatment options. This will mean talking about your desired look and hairline style, agreeing on it together. We offer a free virtual mock-up at every consultation, so if you have that to hand it may help to discuss your desired look. We want you to feel completely comfortable before we begin. You can ask any questions you may have and our technicians are always happy to help. 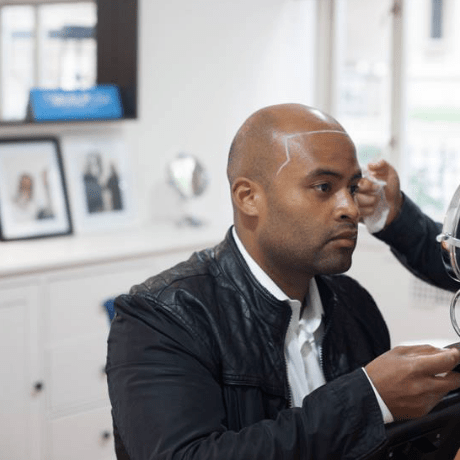 They have all had scalp micropigmentation themselves so have first-hand experience to offer. Once you have finished the discussion it’s time to outline your new hairline. The technician will use either wax or white makeup pencil to draw the hairline on your scalp. This allows you to check and adjust it until you are satisfied. It may take a little while to find a spot you are happy with. But don’t worry as this is completely normal and it’s important to get it right. The next job for the technician is to look at your pigment requirements and the density required. They will also need to check your scalp for any scars or blemishes they will have to take into account. It is entirely up to you if you wish to keep your scars in place. Sometimes it is a good idea to further enhance the authenticity of the treatment. Once this has all been finished, the technician will prepare the pigment, the machine and begin the treatment. The first session lasts anywhere between two to four hours in total, depending on the amount of area to be treated. This includes the preparation for the hairline and initial discussion. You will be asked to sit either in an upright or lie down massage chair during each session. This is why we advise that you wear comfortable clothing so that you can relax during the treatment. This is where the first ‘layer’ of pigmentation is put in place on the scalp. It creates the outline for the technician to follow in the second and third sessions. Some people are concerned that hair SMP will hurt. However, you’ll quickly notice that it barely causes any pain at all once you begin. The longer you are in the session, you less it will bother you. During the session, the technician will take regular breaks. This helps them remain focused on doing a fantastic job and helps to keep you relaxed. If you want to check the progress there is usually a hand mirror available you can use. You will also get regular breaks if needed of around 15-30 minutes during the session. This allows you to go to the toilet, grab a quick cigarette or grab a drink of coffee or water. Once finished, the technician will discuss what they completed and anything they noticed during the session. There will be at least a week in-between your first Scalp Micropigmentation session and the second, to allow your skin to heal and pigmentation to settle. Finally, your practitioner will provide you with some AnD cream, go through the aftercare advice with you ( which can be found on our website here in case you forget ) and check you are all set for your second session the following week.